My reporter sent me the write up because I’d need a subscription to be able to see the real thing. Writers write where their heart is. That is exactly what Clearwater native Cynthia Frank-Stupnik has done, many times over. From what started as a quest in personal research of her family history, became a pursuit in chronicling the incredible women who founded Clearwater. The novel follows non-fiction protagonist Maude Porter, a daughter of the Clearwater village founders. She keeps not just a millinery shop, but an eye on the town from her second story window. Porter’s concern for the undereducated and overworked women around her grows as women’s suffrage and arguments for equal rights become more prevalent in her turn-of-the-century town. Prohibition is just the start of a tumultuous struggle to end the violence in her community. “She (Porter) was an important character in Clearwater. Her story needed to be told,” Frank-Stupnik said. Porter was born in 1862 to early settlers, her mother a pioneer and her father a fur trader and shoemaker in the Clearwater area. She was one of the first children to be born in Wright County. Porter worked as a hatmaker, never married, and lived in Clearwater all her life. She later became a supporter of women’s suffrage and of the Christian Women’s Temperance Union, trying to warn her town of the dangers of alcohol and get women the right to vote. Inspired, Frank-Stupnik decided to preserve Porter’s legacy and Clearwater’s history in her novel. Frank-Stupnik herself, as a child, was lucky enough to have seen Porter at both the Clearwater Centennial in 1955 and again at the Clearwater-Clear Lake bridge opening in 1960. Porter, being the oldest Clearwater resident, had the honor of cutting the ribbon at the ceremony. When she died at the age of 103 in 1965, she was Wright County’s oldest citizen. Now a retired English professor, Frank-Stupnik considers herself not just a novelist but a poet, researcher, and teacher. “I never sit too long. I’m always writing, reading, researching,” she said. She received the Women in United Methodist History Research Grant from the United Methodist Church General Commission on Archives and History for her work on the Reverend Mary MacNicholl, who was the first Methodist ordained woman in Minnesota. Keeping her role models alive in her books is Frank-Stupnik’s way of documenting Clearwater’s history for the inspiration of future generations in an engaging and impactful way. “My heart is out here, by the Mississippi River … my veins are attached to this area,” she said. “Pins and Needles” is the second in a series about Clearwater’s Main Street women. Frank-Stupnik’s first novel in the series “Scruples & Drams” follows Minnesota pioneer, and Stupnik ’s childhood hero, Jennie Phillips. Phillip’s story recounts the factual unsolved murder of a young girl in Lynden Township and the problem of dangerous medicines commonly used in 1895. The ethical dilemma posed to Jennie Philips and the safety and health of the women in her town sets the stage for an important story in the history of Minnesota women. Frank-Stupnik is working on her next book in the series, but not revealing any details yet. 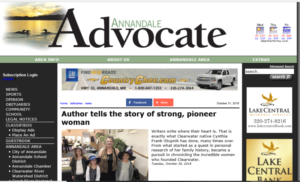 She is also the author of “Around Clearwater,” a collection of early historical documents, photos, and memories of Clearwater when it was just a budding village. It was published by Arcadia in 2016. Learn more about Cynthia Frank-Stupnik at www.cynthiafrankstupnik.com. Her books are sold on Amazon, at Barnes & Noble, and on her website. Maude drove down the middle of Main Street. It was still dark outside, no moon to guide her way. The only light came from the fresh snow her horse and sleigh glided over, paving a fresh pathway. As her horse Rosemary cantered past her friend Jennie Phillips’s home, Maude saw some light in the windows from oil lamps. It seemed odd, even for Jennie who was an early riser, for the whole house to be awake already. It was only a little after four in the morning. Rosemary knew where to take Maude, right to George Boutwell’s Hardware Store where she had been renting the upstairs for a hat shop for a few years. When she stepped down from the sleigh, she sank into knee-deep snow. After tying Rosemary to the post, she plodded in and out of the white stuff, creating deep pockets as she made her way to the side of the building. Maude stopped. Large boot prints led from Pat Quinn’s Saloon across the street to the outside stairway. She looked up to see each snowy step mashed flat. Maude cupped her hands and looked into the hardware store window. She saw no light. She doubted George would be around. It was early Sunday, church day, and he seldom worked or opened the store on the Sabbath. Neither were these his footsteps leading from the saloon and up the steps. Now, which of Pat Quinn’s drunks was up to no good this time? Step-by-slippery step, holding tightly to the railing, Maude climbed the staircase. As she neared the top, she saw more mashed snow on the landing. Two snowy boot prints on the bottom half of the door proved to her someone had tried kicking it open. Scared and angry, Maude wondered if she should enter and lock herself in or hop back in her buggy and return home. No matter what decision she made, she would be easy prey. Whoever tried to break in could be watching her right now. Unlocking, she slowly opened into the darkness. After reaching for a match on the shelf, Maude’s hands shook as she lit the hanging oil lamp. Shivering from cold and fear, she sighed in relief when she saw no other snowy footprints on the rug besides her own. She closed the door, bolting it behind her. After she rolled up a newspaper, Maude splayed thin pieces of wood into the stove. Soon a small flame swayed and snapped. Once it got roaring, she put a heavier chunk on top and slid the teakettle onto the burner. It would take a while for the ice to melt and come to a boil. If anyone were watching for her, he’d know she was here; the horse and buggy standing outside, and the burning lamp were sure-tale signs. Regardless, Maude did not feel comfortable riding back home alone. As she waited for the room to warm up, she huddled in her coat nervously sitting on the edge of the chair and reaching for the little heat she could feel from the stove.